Brew up efficiency with a better way of preparing iced coffee or tea! The Liquid Cooler dispenser provides a quick and easy method for cooling hot liquids. In less than five minutes, hot coffee or tea can be cooled by simply pouring the liquid into the top tank of the dispenser. The dispenser’s holding tank stores up to four pots or seven litres. 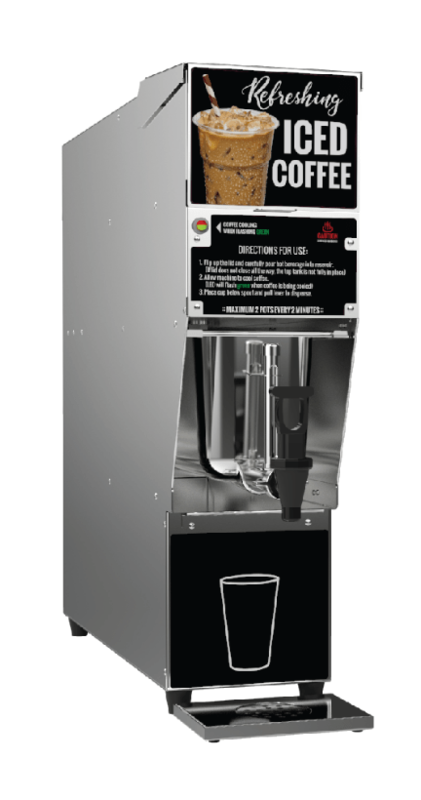 The Liquid Cooler will allow you to expand your product line without adding new inventory. And it reduces hot coffee and tea waste; leftovers can be chilled and kept fresh for up to 12 hours! Your customers will love the increased menu variety, while you can enjoy increases in sales and profitability. Note: This product is available for large quantity orders only. Enables businesses to use about-to-expire hot coffee or tea to produce iced drinks. Reduces the need to throw out expired ready-to-drink iced coffee or tea. Has a compact countertop design. Its tank stores up to four pots of cooled liquid to allow for quick dispense. Has easily removable top and bottom tanks for cleaning. Is equipped with an indication light that notifies when the unit is turned on or in use. Has a coaxial coil heat exchanger with stainless-steel product tube. Comes with a standard one year, on-site parts and labor warranty. Supported by an extensive certified service partner network and the SureShot Technical Assistance Center. 25.25" x 7" x 26"
Dimensions (LxWxH): 25.25" x 7" x 26"